You can't solve skin concerns just by using cleansers that can only remove makeup residue. 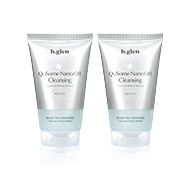 QuSome NanoOff Cleansing washes off air pollutants that accumulate and produce reactive oxygen species—a leading cause of aging. Boldly removes even the finest dirt and makeup. Thoroughly cleansed skin with Hybrid Cleansing.